Museo Nacional Centro de Arte Reina Sofia – If galleries are more up your street, then a visit to the Museo Nacional Centro de Arte Reina Sofia is definitely recommended. This gallery is as beautiful and interesting as its elaborate name, and provides the perfect place to spend a lazy summer afternoon. Here is the site map for the Madrid City Tourist Guide. You can easily find any page on our website by clicking on the links below. If you would like to get in contact with us for any reason, please send an email to the address below. Madrid Tourist Offices – Whenever you go on holiday it is always a good idea to get in touch with one of the local tourist offices. In Madrid, there are numerous places you can go to seek out more information about the capital city of Spain. 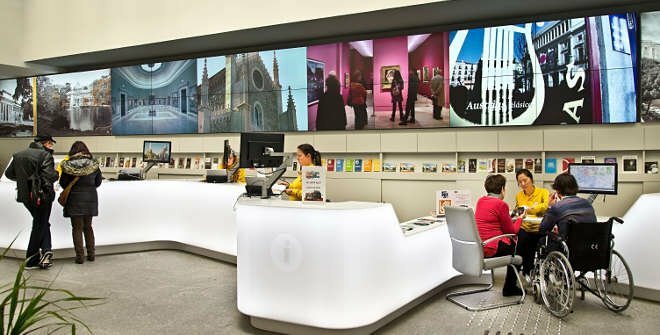 The Tourist Information Offices in Madrid offer a whole host of information, including how to book hotels and hostels, how to organise a tour, and how to find your way to the best sights in the city. They can also help you with maps, general directions, and information of public transport. Far too many people neglect to visit tourist information offices when they go on vacation. However, an hour spent at the Madrid Tourist Office is an hour very well spent. The professional and extremely helpful staff in these offices know a lot about the city they operate in, and can help you find things that you would have otherwise never have known about. In Madrid, this service is indispensable, as there is so much to do and see in the capital that the only way you can truly figure out what is best to see is to talk to the people who know the city best – the tourist information officers.